Hydrogen sulphide (H2S) is a potent inhibitor of aerobic respiration. However populations of shortfin molly fish managed to colonise springs with high concentrations of dissolved hydrogen sulphide. In a new study researchers from LOEWE Biodiversity and Climate Research Centre (BiK-F) and the Goethe University Frankfurt am Main present evidence of genetic changes minimizing the harmful effects of H2S which enable the fish to survive in this deleterious environment. The study provides insight into the molecular mechanisms of this key adaptation for the first time. It is published online today in Nature Communications. Shortfin molly fishes (Poecilia mexicana) may only measure a few inches, but they are still exceptional. Populations of Poecilia mexicana, whose relatives are the well-known guppy, colonised sulphide-rich volcanic springs in Southern Mexico. In making this particular habitat their home, they have made the impossible possible, because hydrogen sulphide (H2S), as for many other animal, is lethal. Even at low concentrations the gas blocks the cytochrome c oxidase-complex (COX). The higher the level of hydrogen sulphide, the more the activity of COX is inhibited. As it is essential for respiration, this turns out to be lethal in the end. A team led by Prof. Dr. Markus Pfenninger, LOEWE Biodiversity and Climate Research Centre (BiK-F) and PD Dr. Martin Plath, Goethe University, has taken a closer look at the survivors. 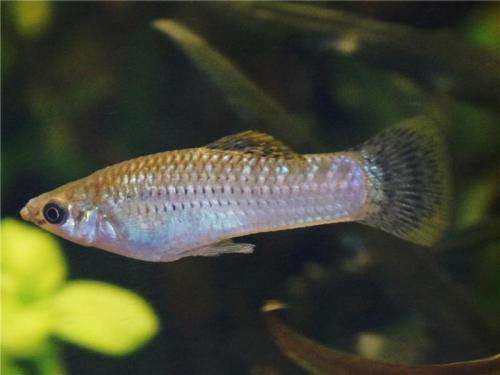 Their analysis showed that the COX activity of individuals of shortfin molly fish which colonise H2S-rich waters remains virtually unchanged under high H2S concentrations. This is due to number of changes in the cox1 and cox3 genes, which have only occurred in populations living in the poisonous springs. Thus, transplanting individuals from non-sulphidic habitat to springs with high H2S levels kills them for sure. "In this paper we analyse the key adaptation to an extreme habitat up to its molecular basis at the level of amino acids. This way, for the first time, we are able to point out, where exactly the adaption has taken place." Pfenninger concludes. The team also modelled three dimensional protein structures in order to shed light on necessary significant structural changes of amino acids in the cox1 gene. Without these structural changes, the colonisation of the H2S-containing water for the fish would have been impossible. By colonising the poisonous springs, where there are hardly any other competitors, the fish may feed on resistant midge larvae that also occur there. The study also shows that closely related populations of a species follow parallel as well as disparate paths in response to similar environmental conditions. Three shortfin molly fish populations were sampled for study. Two of the populations show the same changes in their genetic material in adapting to the hostile conditions. However this proved to be not the case for the third population of shortfin molly fish. Whereas these fish also tolerate high levels hydrogen sulphide, the mechanism enabling their adaptation is still subject to ongoing research. Hydrogen sulfide: The next anti-aging agent? Natural gases a therapy for heart disease?